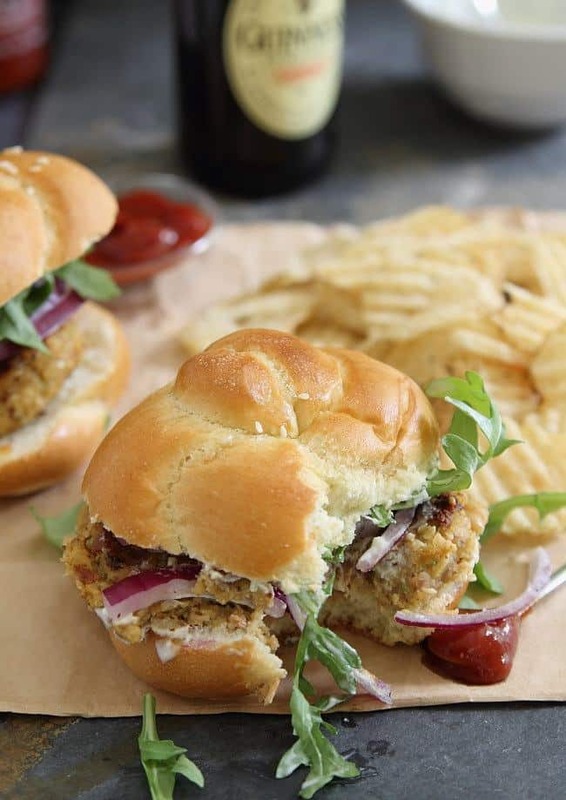 These spicy bacon chickpea burgers are a fun way to mix up burger night. I’d make a horrible vegetarian. I had about 10 different directions floating around in my head for chickpea burgers and pretty much all of them involved some sort of animal product mixed up in there. 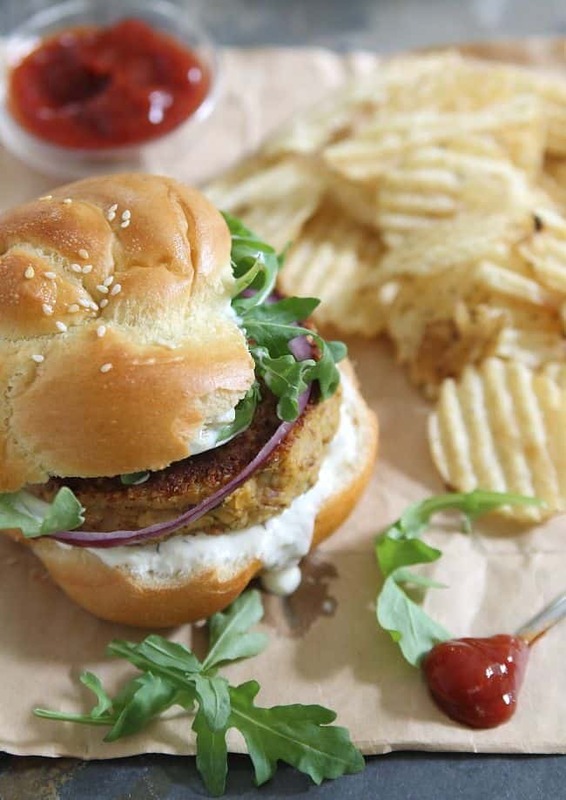 Do non-vegetarians even eat chickpea burgers? I mean, I kinda love them. But, I also happen to love bacon. And much to a vegetarian’s dismay, crispy salty Jones Dairy Farm bacon happens to go really well with smashed up chickpeas and some spicy sriracha in what I’m going to call this hipster’s delight of a burger. It’s got a crispy golden exterior with an almost hummus like inside except loaded with little bacon bits. Omg, wouldn’t that be the best hummus flavor ever? Bacon hummus. How has no one gotten on board that ship yet?! I garnished it with some spicy arugula and tangy yogurt sauce (yogurt + roasted garlic..easiest, best dip/sauce/spread ever and you’ll use it on EVERYTHING) for one heck of a delicious bite. Pretty sure this proves pigs, legumes and plants can all coexist under one nicely toasted bun. Heat a large skillet over medium-high heat and cook bacon. Drain bacon on a paper towel and reserve the grease in the skillet. Place half the chickpeas in a food processor and pulse a few times until coarsely chopped. Transfer to a large bowl. Add the remaining chickpeas and all other ingredients except the egg to the food processor. Process until almost a paste like texture and transfer to the bowl. Chop the bacon and add it with the beaten egg to the bowl, mix together until well combined. With wet hands, form into four patties, place on a parchment lined baking sheet and refrigerate for 20 minutes. Heat the skillet with the bacon grease in it over medium-high heat. Place the patties in the pan and cook for about 3-4 minutes per side until golden brown and crispy. 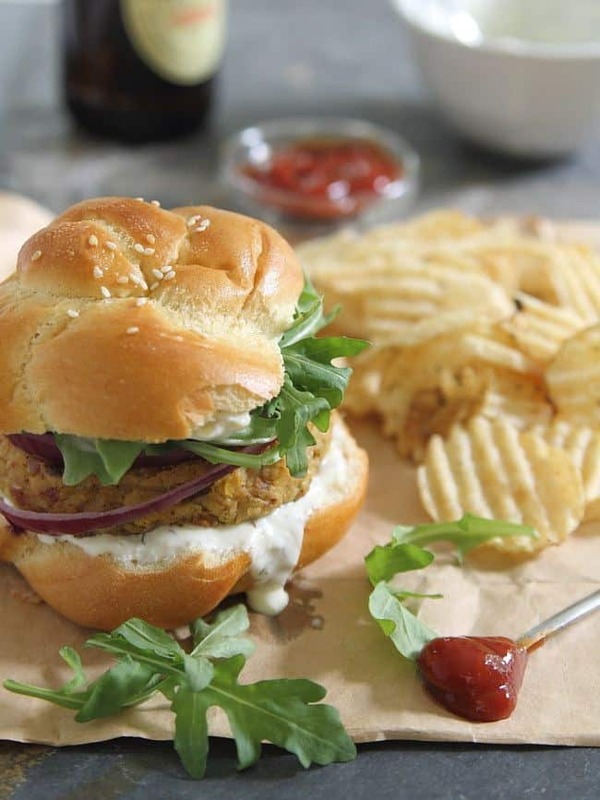 Serve the burgers on a bun with desired toppings like arugula, red onion and roasted garlic yogurt sauce. *This post is sponsored by Jones Dairy Farm. All opinions and thoughts are my own. Thank you for supporting my recipes for the brands I choose to work with. Considering my diet is like 98% meat (only a slight exaggeration) I would make a fail vegetarian too. But, I have been trying to eat more chickpeas since, according to Pinterest, all the cool kids are doing it. With bacon? I am all over them now. Pinned! Oh wow, I must try this. I love all the flavors going on in here. Pinned! I’ve been playing arund with a few veggie burgers recently and this one sounds delicious, I’m not a veggie so bacon and chickpeas sounds awesome to me! I would make a terrible vegetarian, unless there is a bacon-terrian, that could go vegetarian and eat the occassional slice of bacon? That I could do. And these I could definitely do too. As meat-lovers, my best friend and I absolutely loved these burgers! Made these one night last week for a girls night and ended up only making two patties from it. We were hungry!